Very few films have $2 billion bragging rights, and soon Marvel will take the slot currently occupied by "Star Wars: The Force Awakens." “Avengers: Infinity War” hit $2 billion worldwide, making it the fourth title to do so at current ticket prices — but that’s not the full story. There’s nothing nefarious here; it’s tricky to calculate combined all-time grosses. The boom in foreign theaters, exchange-rate fluctuations, and unreliable historical data are among the elements that make all-time comparisons less reliable than domestic estimates. In adjusted box office, the $2-billion ranks include two Spielberg films (“Jurassic Park” and “E.T.”), “Star Wars,” and likely “Gone With the Wind.” Other possibilities are “The Sound of Music,” “Dr. Zhivago,” Disney’s early cartoon classics, and the original Bond films, but the absence of reliable foreign numbers make that impossible to confirm. Domestically, “Infinity” should top out at $675 million-$680 million. “Black Panther” is at $700 million domestic; “Wonder Woman” made $407 million domestic. Worldwide, “Black Panther” made $1.35 million; “Wonder Woman,” $822 million. Also impressive is the foreign-domestic split. 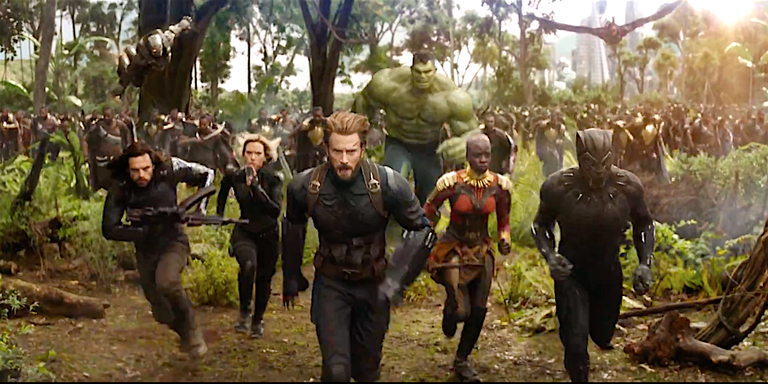 “Avengers: Infinity War” currently stands at 67.2 percent foreign, 32.8 percent domestic. “Avengers: Age of Ultron” three years ago was virtually identical, with 67.3 to 32.7. This contrasts with male-dominated action series like the “Fast and Furious” and “Transformers” films (75 percent to 82 percent foreign), the most recent “Pirates of the Caribbean” (78 percent foreign), and most animated titles (Fox and Universal often approach 80 percent foreign). “Star Wars” and female-driven films see closer to a 50/50 split. These splits impact what gets made, the budgets assigned to them, and how American theaters fare. Too many films with overwhelmingly foreign appeal impact domestic exhibition, since studios finance and release a finite number of films. The return to a 65/35 split between foreign and domestic box office is at the high end for Marvel, with recent Marvel sequels like “Thor: Ragnorok” and “Spider-Man: Homecoming” standing closer to 60/40. An exception is the Hugh Jackman-led “X-Men: Apocalypse,” which scored 71 percent foreign. The two R-rated “Deadpool” films only saw foreign performance in the mid-50s, with China playing neither film.